The cap on payday loans may have been introduced over 18 months ago, but a recent report by the Citizen’s Advice Bureau has found that many lenders are taking their time when it comes to ensuring the loans they offer are affordable for their customers. Despite strict regulatory changes that have seen interest rates capped, roll-overs stopped and complaints about the industry halved; Citizen’s Advice Bureau (CAB) has found that many short-term lenders are failing consumers by conducting inadequate affordability checks. Some lenders were not conducting any affordability checks at all – meaning those customers are twice as likely to experience difficulty repaying their loan. Understandably CAB has made some recommendations to ensure that consumers get the best deal possible from their payday loan provider, but for Mr Lender; these recommendations are already a reality. 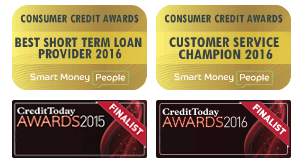 As a responsible lender who recently won ‘Best Short Term Loan Provider’ and ‘Customer Service Champion’ at the 2016 Consumer Credit Awards, Mr Lender stands out from the short-term lending crowd as one of the few providers that puts affordability at the forefront of their customers’ loan experience. Like most of our competitors, we ask our customers what their monthly expenditure is as standard. But unlike our competitors, we don’t rely solely on an online application form when it comes to judging whether or not the customer can actually afford the loan. We take the time to provide a personal service by talking directly to every single customer. Our dedicated customer services team goes through a detailed affordability assessment over the phone, double-checking income and expenditure to ensure the customer can actually afford to repay the amount they wish to borrow. “Excellent customer service on the phone. So tick one for Mr Lender who are already conducting those thorough affordability checks the CAB are recommending. Tick two comes from the fact that Mr Lender takes the time to make consumers aware that they can repay their instalments early (and therefore save money on interest), with tick three coming from the fact that we go through all the details of the loan with the consumer, making sure that they fully read and understand their contract. “Very quick and helpful service. Everything was explained to me, even “the small print that nobody reads. The final recommendation the CAB have put forward relates to customers who are struggling to repay their loans. Many lenders are not doing enough to encourage customers to contact them, which means a high number of customers are not being provided with the necessary support to help them find an affordable alternative to to repaying their loan in full. At Mr Lender, we understand that customers can sometimes get into difficulty repaying their loans. We work hard to try to contact every customer who is struggling to make them aware of our alternative repayment plans which offer these customers discounts on their overdue balance (sometimes up to 50% taken off). Our aim is to work with our customers to find the most affordable option that suits their budget. We understand that debt is a scary thing that many people are embarrassed by or find stressful to deal with, so we try to help in any way possible. We provide customers with information on free, independent advice and support ~from other not-for-profit organisations. We will always go out of our way to do right by our customers, as we truly believe that our customers are the heart of our business. It’s not just about ‘Treating Customers Fairly’ according to FCA regulations, its about treating them with decency and providing them with the help and support that they need, and treating them no differently than anyone else. Citizen’s Advice Bureau asks the questions of whether consumers are getting a better deal after the payday loan cap? The truth is, this isn’t the right question. It’s not about getting a generic ‘better’ deal, it’s about getting the best deal that’s right for each individual customer, a deal that is fair and transparent, a deal that suits each individual customer’s unique budget and affordability. So in keeping with that question, we at Mr Lender believe we are one of the very few lenders who have that question answered. *Reviews figures accurate at time of writing on 16 November 2016 on Reviews.co.uk. Next Next post: Bank accounts with benefits: the next mis-selling scandal?